Delbert Crespin is a Santo Domingo artist who makes classic banded stripe disk bead necklaces and also makes elaborate mosaic inlay necklaces. His inlay work is "primitive" and meant to be evocative of early Santo Domingo creations. Unlike Chris Nieto's inlay work, which shows the precision of German engineering, Delbert's inlay necklaces exhibit the ethos of yesteryear and look like anthropological artifacts on the day they are finished. Simply exquisite, both in its conception and execution as a work of wearable art. This pendant necklace rates a whole series of superlatives. 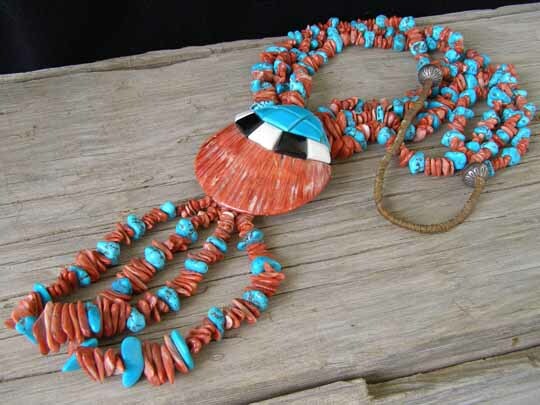 From the beveled tiles of Kingman turquoise, jet and white clam which are inlaid on the large spiny oyster shell to the rich three-strand necklace of Kingman turquoise nuggets and red spiny oyster, this necklace is a superior piece of workmanship and design. Two rich jocla loops hang from the lower lip of the large pendant shell reiterating the mix of red and blue present in three strands in the necklace portion. Finished off with a tradional wrap, this is as fine a spiny oyster pendant necklace as you will see for some time to come. Truly superb.